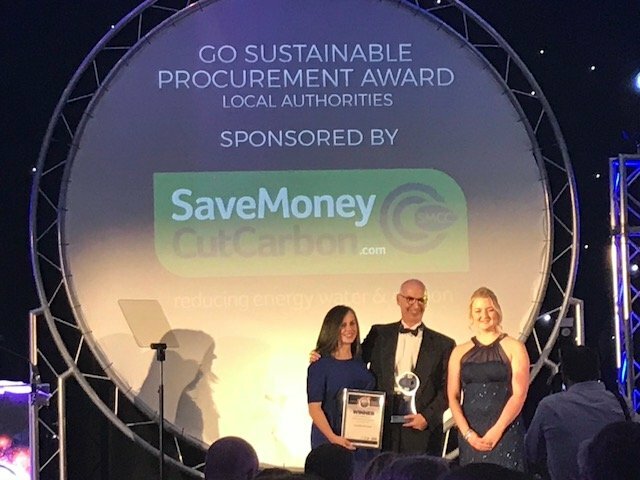 Scotland Excel, the Centre of Procurement Expertise for local government in Scotland, last night won the GO Award for sustainable procurement, sponsored by SaveMoneyCutCarbon. The centre is funded by all 32 councils and is one of the Scottish public sector’s most successful shared services. The GO Awards at the Glasgow Marriott Hotel rounded off an excellent day, with the Procurex Scotland exhibition and conference at the SEC Glasgow providing a unique opportunity to share expertise and knowledge. The GO Award for sustainable procurement in local authorities, presented by Consultative Sales Executive Hannah Deeley, recognises the key role that public procurement plays to provide a more sustainable and equitable society. The awards highlighted fresh thinking and new approaches that benefit Scotland.